Australia, the US and Japan participated in a sinking exercise, SINKEX, on 12 July during the RIMPAC (Rim of the Pacific) exercise in Hawaii. The US Army fired a new anti-ship missile from the back of a truck at a decommissioned tank landing ship, ex-USS Racine (sistership of the Royal Australian Navy’s former amphibious warships Kanimbla and Manoora). The Japan Ground Self-Defence Force fired its own Mitsubishi Type 12 surface-to-air missile. Analysts link this exercise to the concept of ‘archipelagic defense’, which the US and Japan are said to be collaborating on to deter Chinese activity in the contested spaces of the Asia–Pacific. China has reportedly launched its 14th Type 052D destroyer, suggesting that the 052D program isn’t over despite the upgrade to the Type 055. The Type 052D is one of the latest generation of guided-missile destroyers and the recently launched edition features a slightly longer helicopter deck. Russia has started upgrading its 3M-14 Kalibr seaborne cruise missiles and 3M-54 anti-ship missiles, which have been operational since 2013. Experts say that the upgrades will increase the missiles’ precision and combat capability without increasing their weight, making them deadlier. The US Marine Corps is planning more tests to increase drone-to-controller ratios, going from six drones per controller to 15. The drones have the potential to give the marines more independence by allowing them to operate in isolated locations in the Pacific, but they must be lightweight and easy to control in order to be effective. The RAAF announced the first successful launch of a harpoon missile from a P-8A aircraft during the RIMPAC exercises in Hawaii. The P-8A Poseidons are due to replace the air force’s AP-3C Orions by 2020. The launch brings the aircraft a step closer to reaching full operational capability after initial operating capability was declared in March. A RAAF hot-air balloon is visiting the Northern Territory (Katherine, Darwin and Batchelor) to promote the start of Exercise Pitch Black 2018. 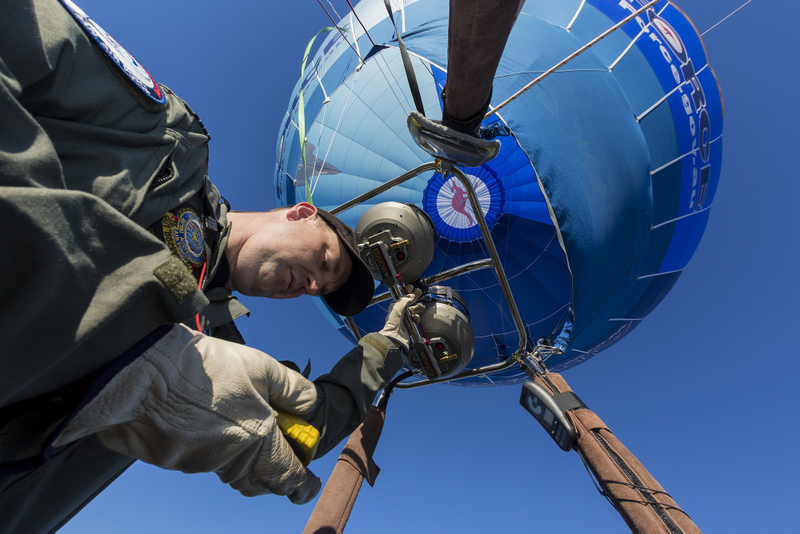 Here’s a video of the balloon from the RAAF Twitter account. The biennial three-week exercise will run from 27 July to 17 August 2018 from RAAF Bases Darwin and Tindal. Participating countries include the US, the Netherlands and Indonesia. With Syrian regime forces advancing on the last rebel-held frontier, the Israeli Defense Force came to the rescue of White Helmets volunteers. Also known as the Civil Defense Force, the White Helmets have been providing medical services and evacuations to wounded civilians in Syrian rebel-held territories. The daring weekend evacuation of more than 400 White Helmets was deemed a humanitarian success by Jordan, Israel, the UK, the EU and the US. The Barrett M107.50-calibre rifle is prized for its ‘range and lethality against personnel and materiel’, making it a weapon of choice in combat. According to military experts, the rifle is a perfect weapon for counterterrorism operations because it can hit a target up to 2,000 metres away. However, Barrett’s customer service may become another selling point—when an M107 rifle failed during a fire fight, US marines called Barrett for some live tech support. The US Army has reversed a decision to discharge a soldier serving under a program that gives immigrants a path to citizenship. Brazilian Lucas Calixto was among a number of soldiers and recruits discharged when the program was suspended by the Defense Department, which said it wanted to strengthen its security provisions. Calixto sued the army, arguing he was not given a chance to challenge the decision. A South Korean–born specialist is now also suing the army after she was discharged in similar circumstances. NASA’s Decade of Light initiative aims to strengthen next-generation communications, and interplanetary internet could be next. Similar to conventional internet, delay/disruption-tolerant networking (DTN) sends data by bundling information and delivering it through various networks. If an interconnection breaks down, DTN stores the bundle until a connection is established. DTN could become integral to terrestrial communications, especially in places with limited network connectivity. The network could also be expanded to enable communication between the moon’s surface, orbiting elements and the Earth. NASA’s innovative Office of Small Business Programs promotes and integrates small businesses into its competitive database of contractors. These businesses account for around half of NASA’s patents, and it’s anticipated that they’ll pioneer the future of space exploration and discovery. In support of its five socioeconomic goals, NASA is making significant headway in engaging small businesses owned by women and by disabled veterans. The naming of the ExoMars rover now lies with the internet. The European Space Agency and UK Space Agency have turned to the masses to name the upcoming rover, set to land on Mars in spring 2021. But to avoid a Boaty McBoatface situation, the UK Space Agency has established a panel to monitor the contest. Residents of countries belonging to the ESA can enter here. Hackers have stolen the health records of 1.5 million Singaporeans in one of the biggest cyberattacks against the country. Prime Minister Lee Hsien Loong’s records were ‘specifically and repeatedly targeted’, with hackers accessing his personal details and prescription information. Experts believe the breadth and sophistication of the attack indicates it was carried out by professional state-backed hackers. Chinese hackers attacked internet-connected devices in an attempt to gather audio and visual intelligence ahead of the Trump–Putin summit in Finland. Analysts point out that internet-of-things devices are particularly vulnerable to such attacks because users often don’t change their passwords from the default ones. Hackers based in the US, France, Italy, Germany and Russia also launched similar attacks during the summit. The US deputy attorney-general, Rod Rosenstein, unveiled a report outlining the government’s strategy to counter interference and influence operations targeting US elections. It’s the first time the Department of Justice has revealed how it plans to tackle external meddling in elections, and is largely in response to Russian interference in the 2016 presidential election. Aakriti Bachhawat, Georgia Grice, Aru Kok and Rebecca Moore are research interns at ASPI. Image courtesy of the Department of Defence.